Outside Sète in direction of Agde you find La Corniche de Neuburg or just La Corniche. This is a summer village, but is slowly growing into more permanent living. You mostly do not expect to find gourmet restaurants in such areas, but Restaurant La Table de Jean is a splendid exception. It is housed in Hôtel La Conga just were the famous beach starts. This is a very good restaurant and is almost always full of guests. We have been there several times with friends and they are all impressed by the good food and good value. The chef Guy Dagorrette has an ability to prepare the traditional food of the area in a fantastic way. Naturally sea-food is the big thing here, but do not hesitate to order meat if you prefer that. My absolute favorites are their home made Foie Gras to start with followed by their Ravioli with lobster. The service is correct – they do what they are there for but nothing more. In this place it is the food that talks and make you feel great. This is not a restaurant you would choose from the outside look of the place. It looks quite plain and there is nothing that gives you a hint that you find a top class gourmet restaurant inside. Revisited x-mas day 2015: Despite we reserved very early we did not get a good table - it was near the entrance. The biggest problem was that we could smell an unpleasant dour from the toilets. The food was not as it is normal days, but acceptable. 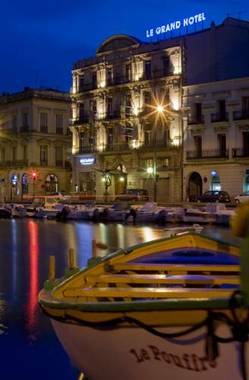 During all time we had our summer studio in Sète we were puzzled because of Hotel de Paris in the center of Sète. It was so odd that the hotel with the best location in Sète was so run down. It was once a beautiful art deco hotel, but now it was more or less a wreck run by an eccentric old lady. Just for curiosity we stayed there one night, but the standard was so poor we had to move. As it was cheap it was however a popular place for motorcycle tourists. Last year when we returned to Sète, the hotel was renovated into a beautiful boutique hotel and the restaurant was fixed up to how it might have been when the hotel was at its best. The food is prepared by the chef Christophe Chiavola and was really a positive experience. When we last visited Sète we noticed that they served lunch in the renovated inside garden, which must be very nice. We did not go there this time though. We have something to look forward to next time we come to Sète. Quai 17, Escale is a gourmet restaurant in the Grand Hôtel in Sète. As there are very few gourmet restaurants in Sète this is something special. The chef Pascal Hemnet creates a combination of modern versions of traditional Mediterranean food and the modern molecular kitchen. At a few special occasions we have visited the restaurant and have always been very pleased with the service and the fantastic food. It was here we first came in contact with molecular cooking and found it very exciting. The restaurant is housed in the beautiful Grand Hotel and the view over the canals in Sète is really nice. Le Minervois Bel is a new experience. We were introduced to it by Swedish friend I have learned to know through blogging about Languedoc. As they live nearby we decided to meet at the very good restaurant Le Minervois Bel in Olonzac. 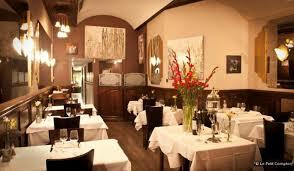 It is a traditional French restaurant and the food is excellent. The prize is very reasonable and the environment is pleasant and so is the service. We had our lunch in the garden which is very nice in the summer. There was no problem whatsoever to change certain things on the set menu. This was really a pleasant experience and I am sure we will return soon again. Revisited 2013: We came back with some other friends that live in the village. This time we sat inside, which is very pleasant in the winter. The food and service was as good as last time and as we sometimes have special demands we were pleased that it was no problem at all to do alterations from the set menu. Revisited September 2013: As always the food was very good and the service pleasant. As this is a gourmet restaurant it is surprising that they do not let you taste the wine - just put the bottle on the table. They also place the small starters and sweets in the end on the corner of the table and let the guests distribute them. Not a serious thing, but not what you expect. Again we had the bad luck to be in the same restaurant as an American party. We were a number of people in the restaurant - English and French - and the noise level was very low. The Americans came in and made it totally impossible for anyone else to communicate. I do not understand why grown up people must behave as they were on a stag-party. Revisited May 2015: We had the menue of the day. It was absolutely perfect and we were sitting in the nice garden. We have only been there once, but it was an experience. It was a birthday and we enjoyed the food enormously. The restaurant Saint Clair is a gourmet sea-food restaurant. Most people in the area say it is the best sea-food place around L’Etang de Thau. The reason why we have not returned after the first time is that we have gone to the neighbor restaurant Le Grand Large that has the same owner and is a little less expensive, but has fantastic food and very nice service. If you are in the Sète area and really want to experience the best sea-food the region can offer – this is the place. So why go away from Sète? The reason is that because of the many tourists Sète restaurants concentrate rather on prize than quality in the summer. It is hard to get the best sea-food in "the center of sea-food" in south of France. A few kilometers away in Balaruc-les- Bains it is a different thing. Revisited May 2013: It was quite a while since we were at this restaurant. As the first time it was a birthday we celebrated. The food was excellent as we remembered from last time, perhaps a little more elaborated this time. The starter we all but one had was their foie gras which is something extra. It was foie gras prepared in different ways presented in a very aesthetic way. All but myself had beef for main course, which was excellent. As this is a fish restaurant I had Bourride de baudroie. It is classic dish that takes a lot of time to make at home so I took the opportunity to eat it here. It is however very filling. Revisited September 2013: we were slightly disapointed this time. My favourite starter with foie gras was not as it normaly is. The starter with Saint Jaques was tastless. The two fish-dishes we had were good, but my wifes lamb was not at all up to standard - tough and not very nice pieces. My dessert was delicious, but the cheese plate was not at all of French standard. During all our visits to Port la Nouvelle we tried a number of restaurants along the promenade, but none of them were worth writing about. Many times we parked the car outside the Casino and we took a walk on the pier or on the beach, but never though that a good restaurant could hide in a casino. Seeing people sitting on the terrace in the summer however made us go in and that came to be the first of many visits. It is without competition the best eating place in Port la Nouvelle as we see it. A casino is a casino, but as soon as you enter the restaurant you are in a totally different environment. The view over the pier and lighthouse is splendid and in the summer you can sit outside on the terrace. 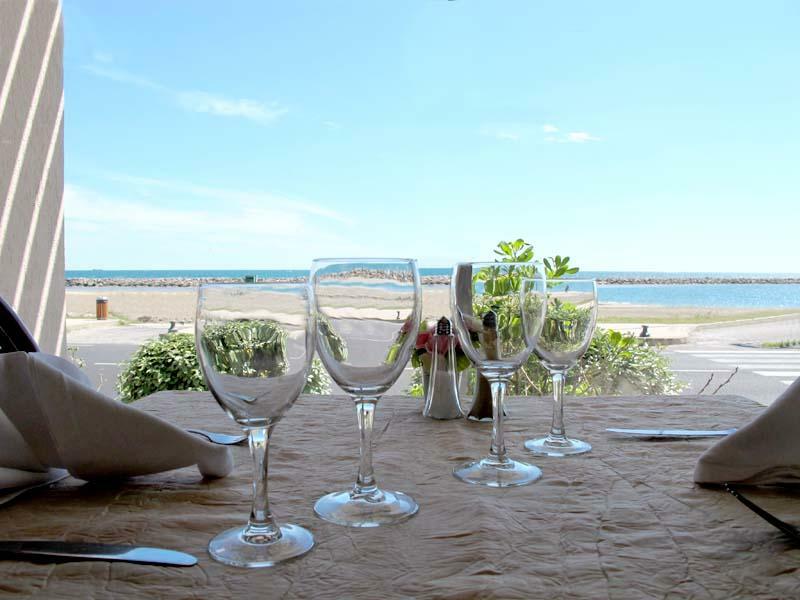 The restaurant is just on the beach and you can see people enjoying themselves in the sea from your restaurant table. The young chef really knows how to prepare good food and she can really take care of the fantastic local products that are available. The prizes are reasonable even for the most prestigious set menu. The service is nice and correct – a little of the old days with a very professional style. You need to call and make a reservation even in low season as many people have found this little treasure. If you go here for lunch you get a gourmet dish for less than a grilled fish in one of the restaurants on the other side of the road. A special thing is that with the most elaborate set menu, everyone gets a token for the casino so they can try their luck. The ladies are always happy to use my token while I take a walk and maybe take some nice photos of the environment. Revisited February 16, 2013: We have visited this place many times and always been satisfied. This time we were however less fortunate. As the weather was absolutely fantastic we were ready for a real good experience on the edge of the sea. My grilled mussels for starter were not very exciting. They were too muck grilled so they had shrunk to nothing and the sauce had very little taste. My wife's starter was however good. As main course I had ray, which I love, but this dish was prepared with spinach and way too salty, so I could not finish it. My wife's dish was a slice of pork tandoori style that was not tender and not very tasty. My wife got cheese instead of a sweet desert, but it was two thick slices of very simple cheese with no taste. We were both very disappointed and made remarks to the waiter. We offered us other dishes, but we did not feel for that. They however only charges us for one set menu. We will return and give them a new chance as the restaurant always have been very good before. Revisited November 2015: It was a long time since we were here. We had the least expensive lunch of the day, which was what we payed for. The wine from Corbières was excellent. Their more expensive menus seemed to be good value though so we might come back in the winter. The service was nice as usual. Revisited June 2018: It was a long time since we were here now but we decided to give it a try. The place was full which is a good sign, but we were a little suspicious anyway from earlier experiences. It was however very good from start to the end. We had a very good gazpacho for starter and the main course of two generous filés of rouge was excellent. As usual my wife had cheese for desert, which was good and I had a really nice strawberry thing. We talked to a couple next to us who lives in the area. They said the place had not been good for a while but the old head waiter had returned and it is excellent now. 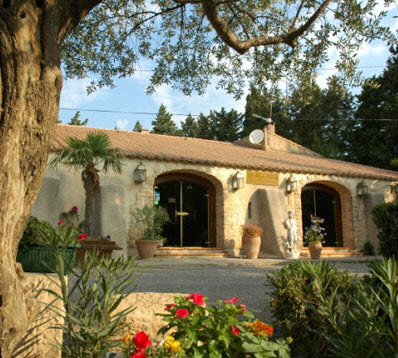 Restaurant la Bergerie is situated at Château de Lastours. A couple of years ago we visited this restaurant quite often. We had birthday parties there and we often took friends there. We have not been there for some time now and it might be time for a revisit. The reason why we stopped going there was that they did not change the menu for a very long time. After having tasted all the dishes, which all were delicious, we got a bit tired of eating the same thing time after time. For those who never have been there it is really worth a visit and you can go there quite a few times before you have explored the menu in full. The service was also very nice and the atmosphere of the restaurant is very pleasant. They only serve wine of their own production, but they are of such quality that you do not need anything else. You can also buy some bottles and bring home and you can have a full tasting in the wine shop. A little special thing is that the castle also is a center for training and other kinds of activities with four wheel drive vehicles. Revisited 2015 after 6 years: It was good and more than that! The service was pleasant as usual and the food was exceptional. We had the three course menu for 26 euros. Our starter was cabbage with a stuffing of game (wild bore) and it was really good. It reminded us a bit of the Swedish traditional dish "kåldolmar". My main was "bavette" which was very nice and tender and the different vegetables that came with it were perfect. I had a chocolate dessert - also very good. We will return soon. Sometimes you want to eat something different and it is not a lot of choice of ethnic food outside the big cities in France. We have a couple of times visited the little Spanish/Mexican restaurant Le Cottage in the center of Narbonne. For someone who is used to real Mexican food it does not have the right character – it is not at all hot. You can look at it as a French version of Mexican and the quality of the food is good and the prizes reasonable. We had two different fajitas – one with beef and one with chicken. Both were very good - the meat tender and the chicken juicy. We could however have shared one between us – it was plenty. Château L’Hospitalet is a very good restaurant with a nice environment but it is also something much more than that. Starting with the restaurant; it is a very popular lunch for business people in the area but also somewhere to go when you are on a vacation trip. The food is quite good at a fairly good prize. The wine you get is of their own production, which means that it is among the best you can get. The owner Gérard Bertrand has been elected the European Wine Producer of the year by The Wine Enthusiast. At least before, you were offered free tasting of wine with your meal, but I think they had to stop that as it was abused, mostly by foreign tourists, that caused a number of accidents on the winding roads in the La Clape mountains. This place is a very good place to go for a half days trip or maybe if you are not from the neighborhood, for a week-end. They have a splendid hotel, several gift shops an enormous wine shop, often high quality art exhibitions and music evenings with jazz in the summer. This place is however, above all, a place to go for wine lovers. The selection of wine is enormous and represents a large number of appellations of Languedoc. The price range is from a few euros per bottle up to prestigious wines for 40 euros and up per bottle. If you eat in the restaurant you get a small discount in the wine shop. Revisited May 2015: We have not been here for some time for other than buying wine. The food has changes from very traditional French food in a gourmet version into something much more posh. It looks very much like the food in top gourmet-restaurants – small portions, a lot of purées and fancy names, but it lacks the intense tastes that make up for quantity in the modern French gourmet kitchen. Even for me who is a very small eater, it was a little too little. I had one of my favorites – wing of ray – which was good but a third of what you mostly get in other restaurants. The price 29 euros for a three course lunch would have been OK if the food have had a taste that lived up to the looks of it and maybe a little more generous portions. This is really one of our favorites. We have never been disappointed and we have been there a number of times. We do not hesitate to say that it is the best gourmet restaurant in Narbonne. The looks of the place from the street is not very exciting. The first time we went there was just because it was a convenient place to go. We ordered the lunch of the day and we were really surprised by the quality of food in what seems to be a simple bar. Behind the bar is however a very nice dining room, not big but very nice. In connection to the bar there is a wine shop there you also can eat the lunch of the day. The lunch menu is always very nice, but the real experience is to eat dinner here. 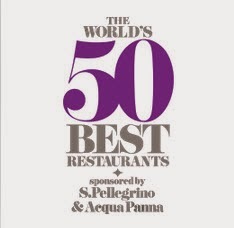 They have several dinner menus and they are all very good value. The food is absolutely excellent and the service is professional and friendly. You can always get very good wines with the food. The wine shop is excellent and have a good selection of local wines of good quality. There are however two complaints. First, the restaurant is not open in the summer and their summer restaurant on the road to Gruissan does not live up to expectations. The other complains is odder. The normal carafe water is absolutely undrinkable. It is taken directly from the tap and so full of chlorine that it even smells chlorine. I can understand that they prefer to sell bottled water, but it is an odd way of selling to serve something that totally destroys your taste buds. Revisited September 2013: As always absolutely perfect, despite we had their lunch of the day. Even when you order their least costly menus you get better food than most restaurants have on their gourmet menus. Friendly and personal service! Revisited November 2013: We never get disappointed here, and today was no exception. The small pre-starter was very nice – a rillettes with mushrooms and dill. The starter was a very nice risotto with small cubes of ham, full of taste. The only complaint was that it was a bit too much. It would have been better served in the same little dish as the opening little pre-starter. Now it looked more like a portion of morning porridge. We could not finish it – not because we did not want to, but we had to leave some room for the rest of the meal. The main dish was absolutely top quality. How about quail stuffed with foie-gras on a bed of red cabbage. I was especially impressed by how the chef had managed to cut out the rib-cage without ruining the bird. It looked absolutely intact with wings and legs. The desert was fresh raspberries with a pistachio cream – really good and not too sweet. Revisited January 2014: It made us happy as usual! Revisited november 2018: The food is still very good and the management always welcoming. The venue is attractive. The two last times however they have had some problems with individuals of of serving personell that did not have a professional attitude to customers. As they however come and go we still think this restaurant is one of the best in Narbonne. Birthday lunch January 2019: Luckily enough we could have a very good lunch here as restaurant La Table Saint Crescent had missed our reservation. Our oldest acquaintance with gourmet food in Narbonne. We have never been disappointed. It is one of those places you can take friends and know they will have a good time. Along the promenade in Narbonne Plage there are a number of summer restaurants that are open all day, which is convenient if you like something to eat while you enjoy the beach. These restaurants are however closed in low season and the food is of more standard quality. There is only one gourmet restaurant that is open all year around at Narbonne Plage. The name is L’Air Marin and is of top quality. It is a typical fish and seafood restaurant, but they serve meat as well. The restaurant has its own fish and sea-food shop so the quality is super. It was our first visit and we were very impressed by the job of the chef Armand Blot. The restaurant has two departments, one inside and one outside covered area and the fish shop is just beside the restaurant so one can see all the delicatessen on display. The restaurant is not in direct connection with the beach, but a little walk away from it in the small and busy main street. People pass through the restaurant area between the outside and the inside area, but that is not disturbing. As it was a Sunday the lunch menu was not available so we had the least expensive menu for 32 euros, which was a good choice. We both started off with a seafood platter that was delicious. As main dish I got a grilled Durade Languedoc style which I enjoyed enormously. It was a big fish. The waiter asked if he should take the fish off the bone for me, but to do that is a part of the culinary experience as I see it, so I said I’ll manage. It is not the first time, in French restaurants, that they had offered me help or given me instructions how to eat whole fish. When you see people eating fish like it was a steak, cutting it across, you understand the problem. My wife’s Lotte with lemon sauce and vanilla was a dream, she said. I ended my meal with a cafe gourmand and my wife had a chocolate dessert that was very good and not to sweet. They have a good selection of local wines on half liter bottles that are perfect for two. The wine prices are reasonable. The service was correct, relaxed and very helpful. It was no problem to make small alterations to the menu and to have special demands in some small details. We are looking forward to next visit when we are going to try the normal lunch menu which is very affordable. The only small complain was the first impression. We had reserved a table on the phone and were given, what I would say, was the least attractive table in the restaurant. It was just inside the entrance, just beside the serving counter and partly in the roasting sun. First we thought it was the last table for two, but when we noticed that couples came after us that had no reservation got much better seating, we were a bit disappointed. Interesting enough it would be more expensive to eat a three course menu on any of the beach restaurants 100 meters away with a sea view and food that is all right, but not any way near this quality. It is also good to know that it is possible to get a good meal even in the winter when it is so pleasant to take long walks on the almost empty beach. Together with friends from Sweden we visited the restaurant to try their set lunch menu. It is starter, main course, cheese, dessert, coffee and a glass of wine for 16 Euros. The starter was all right. One of us had a sirloin steak for main course which was excellent and the three of us had a gratin on Saint Jaques, which was a disappointment. The number of Saint-Jaques was 3 to 5 in the gratin – the rest was mashed potatoes. The cheese was all right and the cake with figs tasted good, but one of us found, what we thought was, a fish-bone, which put us off a bit. It was actually a straw from the baking brush, but still! Anyhow, the waiter was very understanding to our complaints and we were offered a glass of champagne (Tattinger) each as compensation. Even if this visit had a few mishaps we will return to the restaurant, but maybe eat one of the more elaborate menus of maybe just a single course and dessert. We would have had the St Valentin´s menu, but that was not available at noon so we set tried one of the other menus. For starters I had oysters and my wife had a dish with what they call gravelax. As it is a Swedish dish it is a bit confusing that it is called "gravelax" as the Swedish name is just "gravlax". They also cut it differently - across the fish - not in thin large slices as in Sweden. It was anyhow good as my oysters from Bouzigue were. For main course we both had back of cod with chanterelles. The cod was perfectly cooked, but lacked totally salt, which we use very little of, but still. There was no salt on the table so we had to ask for it. A bigger problem was however that the chantrelles were not properly cleaned. It is very unpleasant to get sand between your teeth every time you take bit of food. The first time we visited we said the service was correct. The second time we had a very good experience of the younger waiter as we had this time, but the senior waiter have not ever given us a feeling we are appreciated customers. We got the same feeling this time. He is correct but has a very unpleasant and snobbish attitude to his customers. One does not feel welcome. We are getting a bit tired of that attitude.